Battlestar Galactica fans are being asked test drive a massively multiplayer online game version of their favorite sci-fi show, from game giant Bigpoint. On Tuesday, the company plans to open a worldwide beta of Battlestar Galactica Online (BSGO), based on the Syfy-channel series, that lets you fly, fight, and wage war as a human or Cylon from the safety of your browser. You can sign up for the beta here. BSGO lets you build and customize your avatar, fly Vipers and Raiders, participate in missions, and explore ships, outposts, and bases. 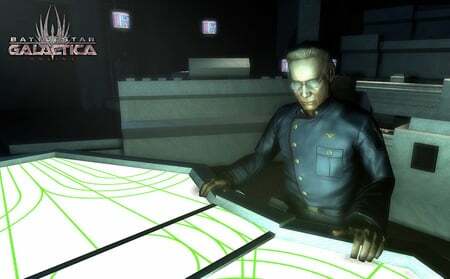 Number Six, Boomer, Starbuck, Admiral Adama, Chief Tyrol, John Cavil, and Leoben Conoy appear as non-player characters. Bigpoint claims "3D graphics with intense gameplay." Bigpoint told The Reg that the point of the beta, which opens on February 8, is to get feedback from BSG fans to ensure that the game is as true to the award-winning show as possible. Jan Wergin, Bigpoint chief technology officer, also told us via email that he's interested in monitoring the performance of the game when it's played by real users. "We have done extensive load-testing and are very happy with the performance of the game," he said. Wergin said the main Erlang architecture is process and machine independent. "We can add machines to a cluster quite easily, increasing performance whenever needed. All processes run independently from one another, which makes the overall architecture extremely fault-tolerant," he said. Spoiler Alert Remind you of anything?